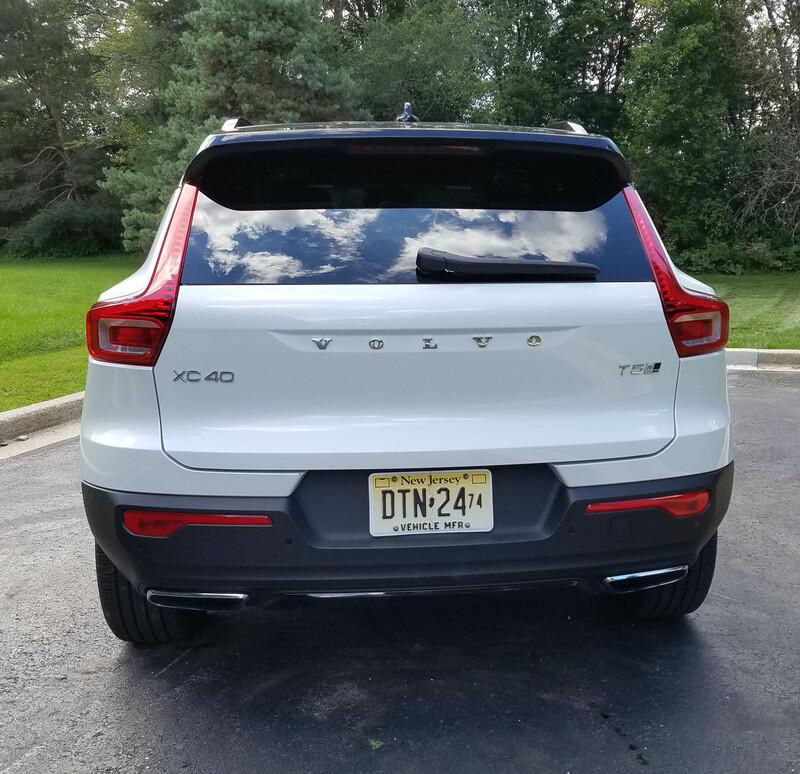 Now comes the Volvo XC40, its first small crossover. I drove a bright metallic white ($595 extra) model with black roof to accent the handsome crossover. The combo adds a little more flair and a sporty look, aided by this being the T5 R-Design model. R-Design adds sportier chassis and suspension tuning, some subtle visual spiffs and more than a dozen upgrades, everything from sport pedals and that black roof to special Nappa leather seats (very comfy), plus dual climate control zones and a power hatch. Coolest visual though was the “cutting edge” aluminum deco design trim on the dash and doors. Sharp! But as good as any vehicle looks, it’s the driving features that often deliver the sale and ultimately lead to long-term happiness among most buyers. 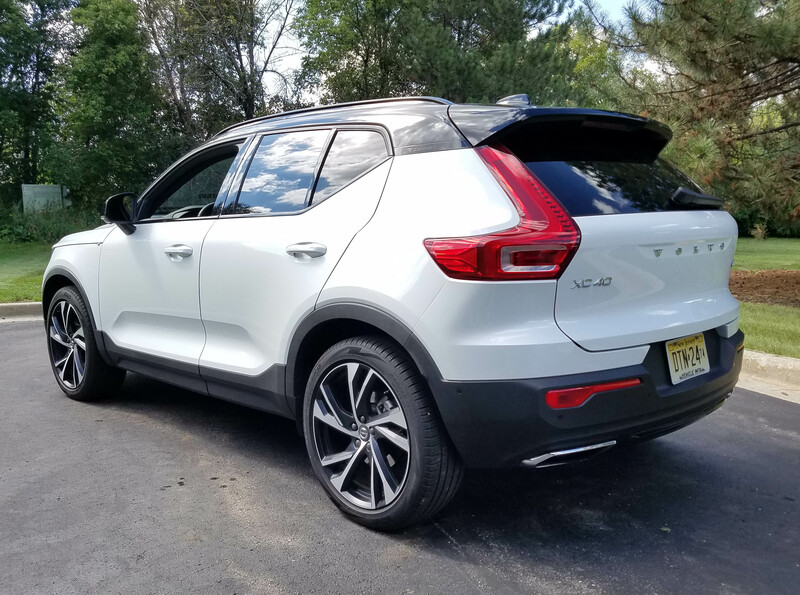 The XC40 is a fun drive, with responsive handling and oodles of power from its turbocharged 2.0-liter I4. Turbos have been the way to go for fuel-efficient yet powerful engines the last five or so years. This one is a dandy, knocking out 248 horsepower and 258 ft.-lbs. of torque. Volvo claims 0 to 60 mph in 6.2 seconds. It’s quick! The T5 R-Design hustles away from a stoplight like a sports coupe, plus offers four drive mode settings. Even in Normal it’s perky, but put it in Dynamic mode and the XC40 is a happy little beast ready to rocket forward. Eco and Off-Road also are available. The 8-speed automatic delivers the power smoothly, not much lag between pressing the accelerator and feeling the crossover launch. Handling is light and easy, but precise enough to feel sporty. The XC40 handles well too, easy to push hard into a corner and not feel any discernible body roll. An occasional annoyance was an over-boosted feeling to the steering that made it a little touchy for side-to-side motion when powering out of a turn. Just relax though and don’t over-adjust the wheel! Ride is good in Normal mode, but not as luxurious as the rest of the Volvo looks and feels. There’s still some bump and jiggle over railroad tracks or expansion joints. Some would say this adds to the vehicle’s sportiness, but at nearly $50 grand I think luxury should play a larger role. For us Wisconsin drivers the T5 is the model we’ll want because all-wheel-drive is standard. The T4 models that are debuting about now, are front-drive. No snow or slop to test this one in, but past experience tells me Volvo’s AWD system works well. 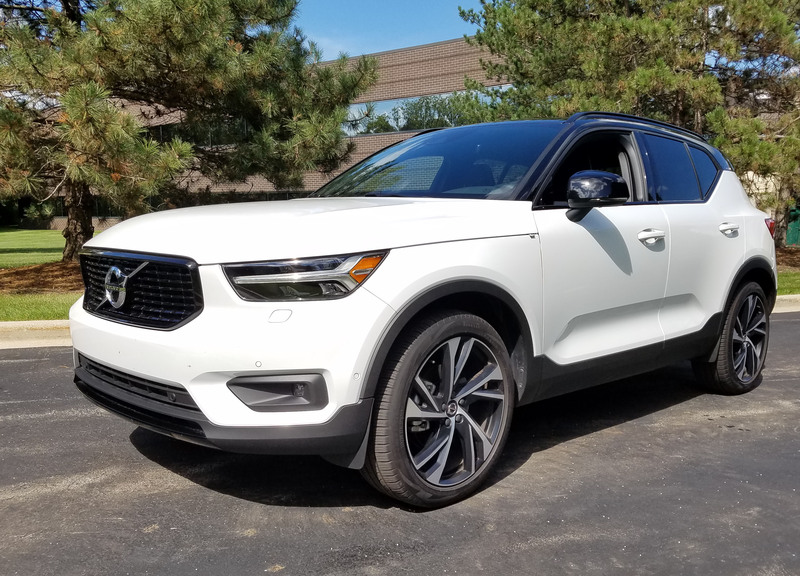 Volvo’s emphasis on safety means there are plenty of safety features on the XC40, but most are part of a plethora of option packages that drive its cost up to mid-size luxury crossover levels. The test crossover came with 10 options, including four packages. While the $2,500 R-Design package is heavy with trim, appearance and sporty suspension options. 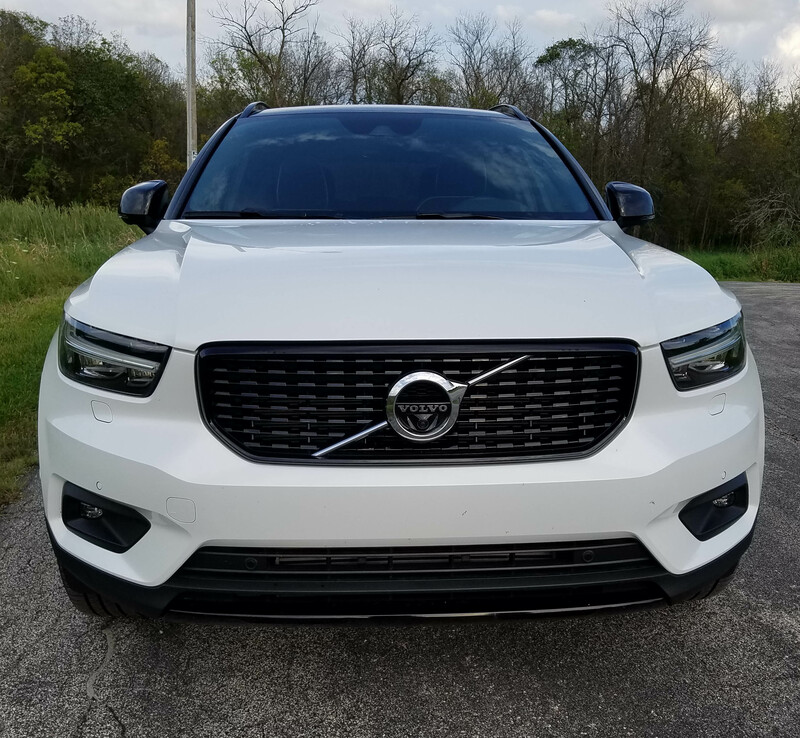 The key packages are the $1,100 Vision Package with a blind-spot warning system, cross-traffic alert with automatic braking, plus park assist sensors to avoid dings in parking lots. It also adds retractable outside rearview mirrors and auto-dimming mirrors. The $900 Premium package has some valuable additions too, including a wireless charging pad, semi-autonomous driving system (basically lane departure assist) with smart cruise control. The premium package also adds a HomeLink system, power folding back seats that you can lower from the tailgate, power headrests, hidden storage under the driver’s seat and a folding cargo floor plus grocery bag holders. Heated windshield washer nozzles and power child rear door locks are included. If you live in a rural area or darker suburb where there are few streetlights, well, the Advanced package may help. It includes a 360-degree camera, LED headlights with an automatic bending feature to help you see around dark corners and headlight washers. That package costs $995. The big touchscreen is easy to use, and see. Certainly the XC40’s interior is quiet and comfortable. I mentioned the seats, which are exceptionally supportive and easy on the derriere. These also are powered and the front seats and steering wheel also were heated, a $750 add-on, but worth it. 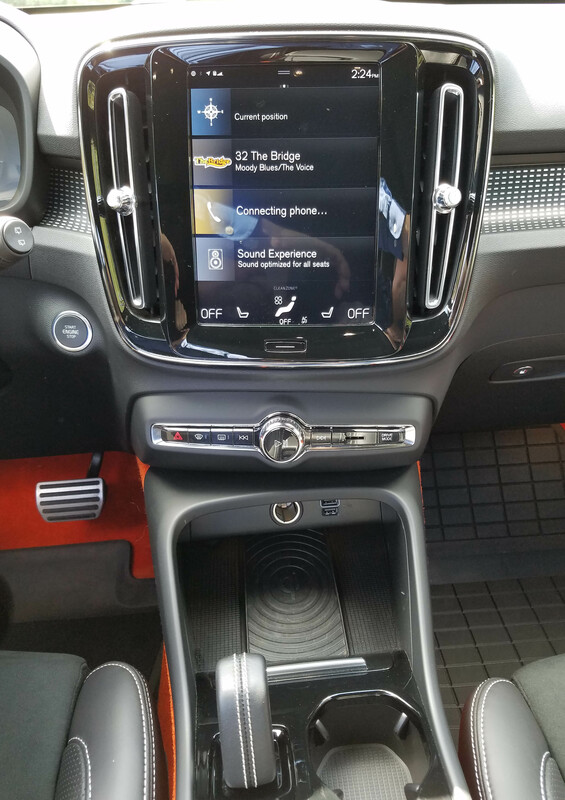 Volvo’s dash is well laid out and includes a large 9-inch touchscreen that sits vertically amid the dash. It was easy to reach and use, no oddball touchpads or console knobs to mess with while driving. I liked the test vehicle’s black textured dash and that optional checked pattern aluminum trim on the dash and doors — very upscale looking. There was black gloss trim around the tall narrow air ducts and touchscreen, plus a chrome ring. The console also was black gloss and there was brushed chrome on the steering wheel hub. Overhead was a panoramic sunroof, $1,200 extra. And the visors flip, but don’t slide here. Seats are plenty roomy front and rear, plus the back ones split and power down to increase cargo area below the power hatch. There’s also some storage under the cargo area floor. 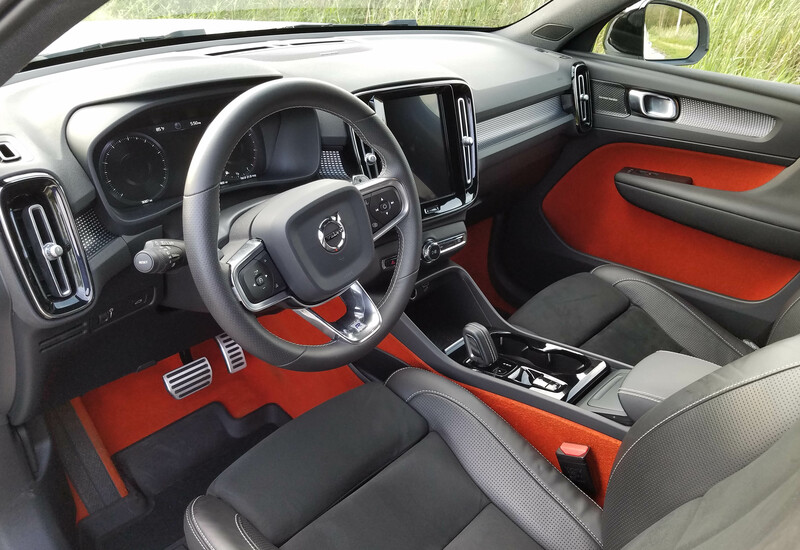 The test XC40 also added what it called orange lava carpet for $100, and it really perked up the interior, along with that aluminum trim. Some folks loved it, some were aghast. It’s basically an indoor/outdoor feel short knap carpet that covers the floor and doors, below that fine black leather trim on the armrests and top door edges. Another plus was a 600-watt Harman Kardon stereo system with 13 speakers. That’s $800 extra, but rocked the interior. A few minor nits need picked. One, it doesn’t appear you can turn the lane departure system off. As I’ve said before, these systems may be fine on a long highway trip, but is annoying in town and on the construction-constricted highways around the city. No one needs a beep, or for the steering wheel to try and adjust the vehicle back to the center of a lane as you dodge construction cones, pot holes and errant phone-texting drivers. I also noticed, and hear from a few automotive colleagues that took note, that a driver must pull or push the stubby Volvo shift lever twice to reach Reverse or Drive. That’s not intuitive and I occasionally found myself coasting backward in Neutral when I intended to be in Drive. If this is a safety feature, it’s not effective. The turbo also prefers premium fuel, which will add to the XC40’s driving cost. I got just 24.6 miles per gallon in about 60% city driving. The EPA says to expect 23 mpg city and 31 highway. The tested T5’s base price is $36,195, including delivery. 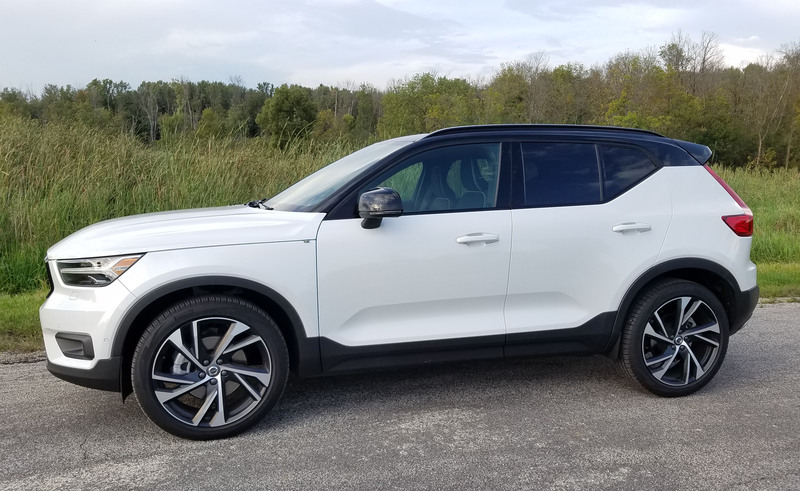 That’s a relative bargain, but after adding 10 options, this R-Design hit $45,935, a level that many luxury small and midsize crossovers now reach regularly. A base T4 Momentum lists at $34,195 with delivery. It has front-drive and a less powerful, 187-horsepower turbo I4. Moving up to an AWD T5 edges that to the $36,195 where this started, but then it became and R-Design with that $2,500 package. Top-end is the T5 Inscription model that has much of the test vehicle’s add-ons and lists for $40,745. This is a fun drive, but pricey once all the options are added. Shop carefully for small luxury crossovers and make sure you’re getting all the safety equipment you need, but not overpaying for more than you need. 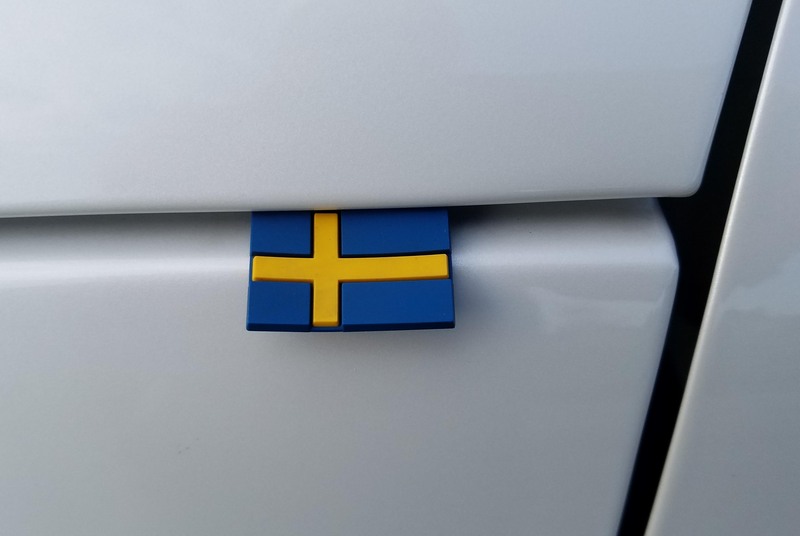 Volvos are still designed in Sweden, and proudly includes this tag hanging out from under the hood on the driver’s side.